When Abraham decided it was time for his son, Isaac, to be married, he wanted the bride to be from the land of his origin, Mesopotamia. He sent his servant, Eliezer, on a journey to select an eligible bride. When Eliezer reached the City of Nahor in Chaldea, he prayed that water from a well would be provided by the woman that was meant to be Isaac’s bride. Rebecca was at the well when Eliezer arrived and she gave water to him and his camels. After hearing the purpose of the journey, Rebecca received her family’s approval and agreed to marry Isaac. Nicolas Poussin’s painting depicts the meeting of Eliezer and Rebecca. While technical problems in painting were being resolved, the use of oil paints and great artistic skills brought about an appreciation that went beyond subject matter. The manner in which a work was painted – the accepted sense of “beauty” at the time it was made – appealed aesthetically to the senses and led to connoisseurship. Jean Pointel, a wealthy French banker and silk merchant was among the collectors of Poussin’s work. 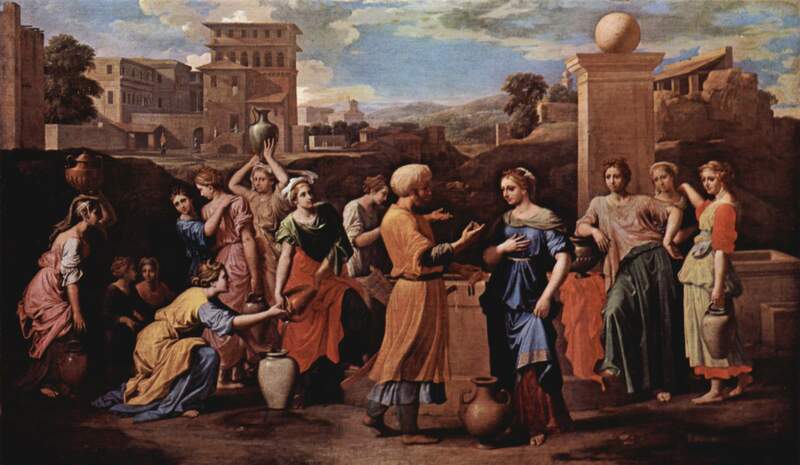 Without suggesting subject matter, Pointel commissioned Poussin to create a painting that, “would portray ‘several women’ in which you can see different beauties.” Poussin used this commission as an opportunity to depict the meeting of Eliezer and Rebecca at the well of Nahor. In Eliezer and Rebecca, Poussin made no attempt to depict a Near Eastern setting. Even Eliezer’s camels – those “bizarre objects” – that would be included surely by a romanticist, were eliminated. At the left side of the painting, a group of Pointel’s “different beauties,” are posed like Roman statues. Except for the woman pouring water and glancing at Rebecca, they seem hardly aware of Eliezer’s presence (in the center wearing a turban). The three women to the right of Rebecca, however, are observing the proposal and reacting with facial expressions and body language. Every aspect of Eliezer and Rebecca is planned, ordered, and controlled. Poussin’s figures exist in the realm of an idealized classical world.